Nicole decided to work because she wanted to make money and because her parents have taught her that working is an important part of life. Her mom and Aimee, the job developer she worked with, were the two strongest influences on her decision to go to work. Nicole currently works part-time as a classroom assistant at a child-care center; she also works about two and a half hours a week at a liquor store. Her goal is to work at the childcare center full-time. When Nicole began planning for her job after graduating from high school, she had an Individual Support Plan (ISP) meeting at New England Business Associates, which she attended with her mom, to review her skills, interests, and the jobs she might like. One of Nicole's strongest interests is in working with children. As a teenager, she enjoyed caring for her little cousins and began to think that a job in childcare would be ideal. Once the job developer knew that Nicole liked childcare, they began looking through the newspaper for possible jobs and attended job interviews at childcare centers. Because Nicole was just beginning her career in childcare, she did not have the certification that most childcare jobs require. This meant that Nicole and her job developer had to narrow their search to jobs that did not require any level of certification. When they found no such jobs, Nicole's job developer decided to negotiate with The Arbors to create a position for Nicole as a part-time assistant. The job developer had a pre-existing relationship with The Arbors. Other individuals receiving employment services through NEBA had been employed there in the past. Being an assistant at The Arbors would allow Nicole to gain work experience in the childcare field while working toward the certifications that would open up more job possibilities for her in the future. 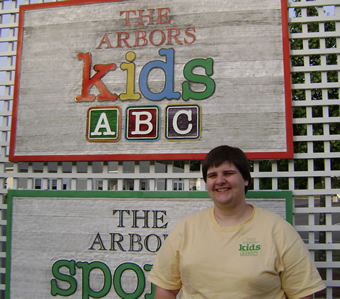 The Arbors' staff agreed to the new position and hired Nicole as a part-time classroom assistant. As part of her responsibilities as a classroom assistant, Nicole clears and cleans the tables used for snack-time and lunch and ensures that the children are comfortable and safe during naptime. Although The Arbors is a promising part-time opportunity, Nicole has to earn a minimum level of certification in the field in order to achieve her goal of working full-time in childcare. Scott, Nicole's job coach , has helped her research local community colleges for child development courses that lead to certification. Upon finding these courses for Nicole, Scott will also have to negotiate with the college to allow in-class and academic supports for Nicole. In addition to pursuing certification, Nicole continues to advance her career in childcare through a separate volunteer opportunity. Furthermore, as Nicole moves towards her goal of a full-time work schedule, she is working a few hours a week at a liquor store, where she receives job coaching on handling shipments of bottles and checking their prices. While this job does not necessarily build her skills in childcare, it has been useful supplementing both the hours and the income of the childcare position. Nicole enjoys her job as a part-time classroom assistant at the childcare center. She especially likes her relationship with other staff, spending time with the children and helping them when they need it. Although she no longer needs job coaching supports on any of her tasks at The Arbors, she still receives job coaching related to earning her certification. A part-time work schedule allows Nicole to keep up with her extra-curricular activities, which include playing bocce in the Special Olympics. Nicole's work at the liquor store provides her with extra hours and income. Overall, Nicole and her family are satisfied that her jobs, volunteer work, and extra-curricular activities are keeping her active. Even with the work of pursuing a childcare certification added to her busy schedule, Nicole is happy with all she is doing and looks forward to advancing to the next step as a full-time childcare professional. Even though Nicole did not have the qualifications for a full-time job, the job developer pursued negotiating a part-time position with a pre-existing professional contact. The part-time job met the needs of a child-care center while providing Nicole with experience relevant to her long-term goal. Career development is an ongoing priority. Nicole's job coach understands that, while she enjoys her work currently, she wants to move forward and grow in her career. Nicole is using multiple paths to advance in her chosen career field. A volunteer opportunity is allowing her to gain more experience in the field, a second job is readying her for a fuller schedule and contributing to her overall income, and continuing education is preparing her to be a professional.